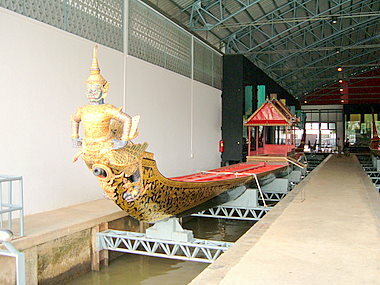 The Royal Barge Museum, on the banks of the Bangkok Noi Canal off the Chao Phraya River, is a huge boathouse that displays eight royal barges that are the product of the finest Thai craftsmanship. Start your tour of the museum by viewing the four-part video clip which will give you an overview of the history of the royal barges. 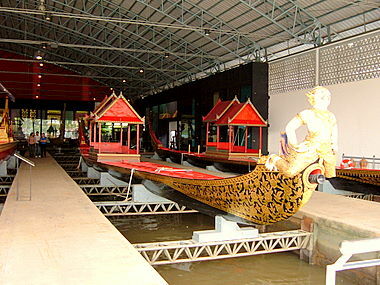 There are various types of barges and the designs depend on the function of the vessel. 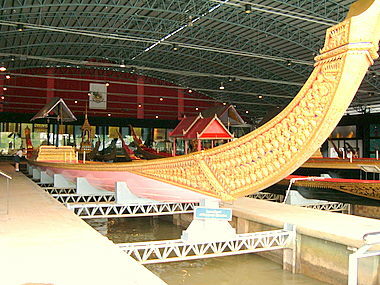 The process in building a royal barge is best illustrated by the construction of the Narai Song Suban H M King Rama IX in 1994. 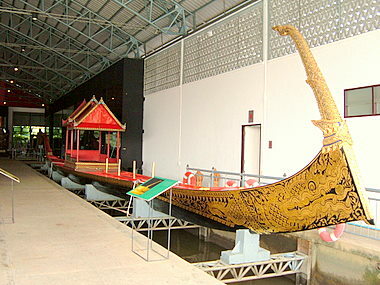 These four Royal Barges on display at the Royal Barge Museum are beautifully adorned with the intricate carvings on the hulls which are elaborately painted. Please see the types of royal barges for details on the barges and crew. 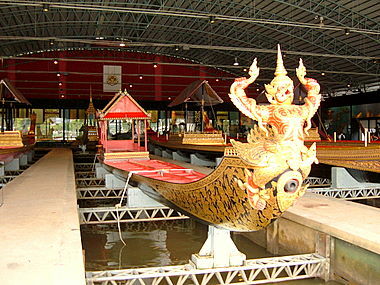 There are two other locations where the barges are kept, the Royal Thai Navy Royal Barge dock near the Arun Amarin Bridge and the Royal Motorboat Dock at the Vasukri Pier. 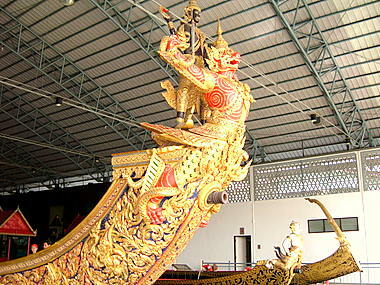 The majestic splendor of the Royal Barges can only be fully appreciated when viewed in the Royal Barge Procession during which up to 50 barges are assembled in a regal flotilla to sail down the Chao Phraya River. 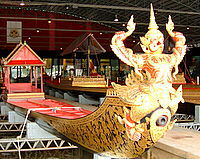 One such procession was the Royal Barge Procession at the APEC closing ceremony in 2003. The grandest procession was Royal Barge Procession 2006 to celebrate the 60th anniversary of the reign of His majesty the King. 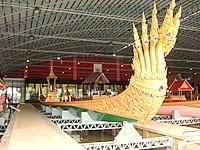 For the latest Royal Barge Procession on 5 November 2007, please see the Royal Barge Procession 2007 to celebrate the 80th birthday of HM King Bhumipol Adulyadej. 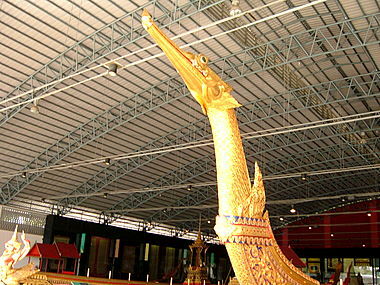 The Royal Barge Museum by the Bangkok Noi is a legacy of Kings for generations to come. All the Chao Phraya river boat services stop at the N12 Phra Pin Klao pier. These include the Chao Phraya river tourist boats and the Chao Phraya river ferries which provide a service from the Phra Chan pier near Sanam Luang to the Phra Pin Klao pier. If you are taking a bus, Service no 149 takes this route. Get the hotel staff to write out the name of the museum in Thai to help you ask for directions on the way. The Royal Barge Museum is open to the public everyday from 9:00 am – 5:00 pm. Entrance fee is 100 baht for foreigners and 30 baht for Thais. There’s an additional charge of 100 baht per camera.